Unlike the kontrabida roles she plays in tv series, Gladys Reyes is all what a bride should be – sweet, beautiful, and so much in-love…to have a garden wedding. Gladys and Chris have had 11 years of relationship before deciding to tie the knot. January 23 of last year, they were able to set the wedding date at Iglesia ni Cristo. Exactly one year after, January 23, 2004, they were married. Q: Why a garden wedding? 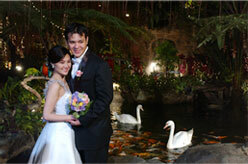 Gladys: It is my dream wedding, I know it would be very romantic to have my wedding in such a setting. Chris feels the same. And when I, together with my best friend Carmi Martin, went to visit Fernwood Gardens, I fell in love with it at first sight! Chris & Gladys. Photo by Smart Shot Studio. Q: How was the wedding preparation? Gladys: It took us 1 year to prepare for the wedding. And though I’ve got a busy work schedule, I personally arranged the details. 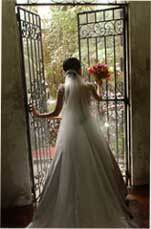 It helped that there are wedding sites like Kasal.com, I got most of my wedding suppliers there. I hired a wedding planner only for the wedding day itself. We were fortunate that we didn’t found difficulty in arranging our requirements…well, ALMOST. Would you believe I was only able to finalize the flowers 2 days before the wedding?! I was undecided whether to get a separate florist or to stick with the flowers that came with the catering package. 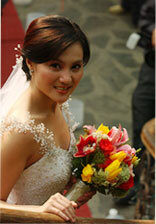 In the end, I got a florist, as one of my godparents offered to sponsor that as wedding gift to us. Q: Can you share your wedding budget? Gladys: We spent around PhP 500,000.00, exactly the same amount we budgeted at the start. Reception venue and catering occupied the biggest chunk. Of course, it helped some of our requirements were given as wedding gifts. Q: Who were your wedding suppliers? Q: Were there any blunders or booboos during your wedding? Gladys: Let me think…nothing major. A funny thing happened, though, during the wedding ceremony. The bestman mistakenly switched the wedding rings and I ended up wearing Chris’ wedding ring, which was too big for my finger! Q: Can you share some tips, advice to fellow brides-to-be? Gladys: Plan at least 1 year in advance. Always consider your budget. Girls, if you want to do garden weddings, I highly recommend you wear comfortable wedding design, and most especially, comfortable wedding shoes (no stilettos please!). Q: Lastly, describe how you feel while walking down the garden aisle. Gladys: Floating. To be honest, everything seemed to happen so fast on the wedding day that I would like to do it again, ha ha.